Our office is conveniently located next to the new Racetrac and in front of the POPLAR SQUARE shopping center on Wendy Bagwell Parkway (also known as HWY 278 / Jimmy Lee Smith Pkwy). This is approximately ¼ mile south of the 278 Movie Theater and the Hiram Super Target (please see the map found under the directions link). The comfort of our patients is a top priority at Hiram Dentistry. Our responsibility is to help each patient achieve a beautiful and healthy smile while ensuring that you feel relaxed and confident with your treatment.Our professional team will be more than happy to answer any questions that you may have regarding your dental care. The gentle dentistry that we provide is further enhanced by our therapeutic massage chairs, warm blankets & pillows, relaxing candles and personal television monitors. Our friendly and competent staff is dedicated to patient comfort and quality of care. We provide the best and latest in dental technology and treatment options. Through the use of digital radiography, computerized imaging, intra-oral cameras, and electronic filing to insurance companies, we can truly focus on providing exceptional care & service for our patients. We are confident that you will enjoy being our patient. 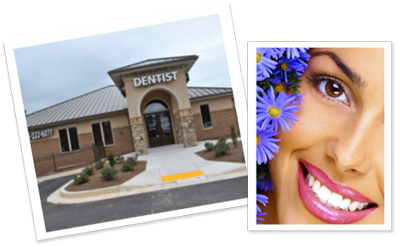 – That is why we invite you to visit Hiram Dentistry today. You can contact us at (770) 222-6077 to schedule an appointment.